The point of a Costume Contest is to kick up the fun factor! Get creative! Costumes must uphold the requirements of Commonwealth Motors to ensure valid entry to contest. The Costume Contest is open, to all people participating in the Commonwealth Halloween Costume Contest, no matter what age you are. Each person may enter only once. Must be from New England states. Must pick up prize in person. 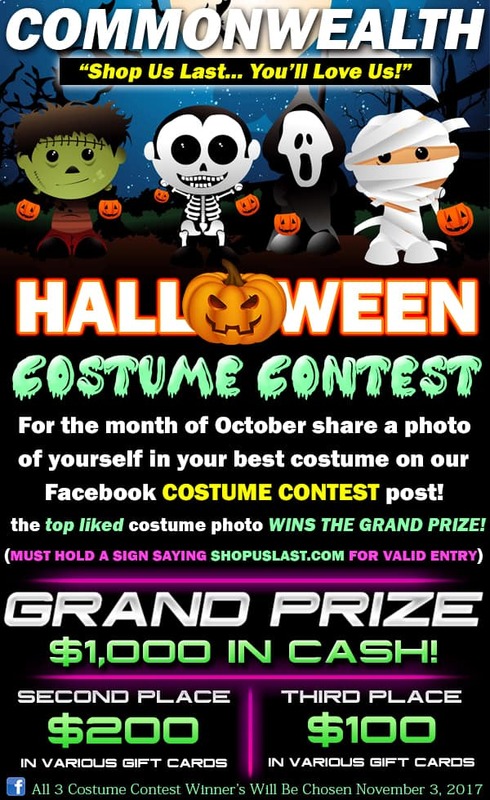 This is an individual contest, you must hold a sign stating “ShopUsLast.com” for valid entries and proof of this years costume. We encourage everyone to consider the creativity of homemade costumes. It’s a FAMILY costume contest and intended for fun. Please, no profanity, overtly violent or adult-themes. All entrants will be judged by the amount of LIKES your photo entry has received! Prizes will be given to the TOP 3 most liked PHOTOS. Winners will be notified by Facebook via the profile you entered with. By registering, all Halloween Costume Contest participants agree to the terms and conditions. Recipients responsible for all state and federal taxes.